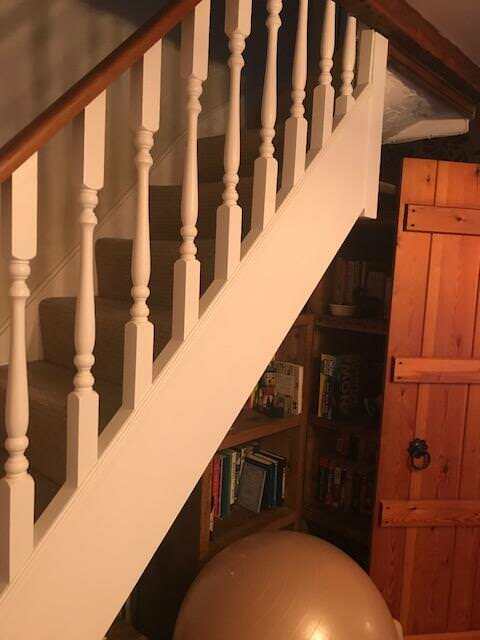 A regular enquiry on the forum is for advice on painting dark varnished finished bannisters and pine furniture white. I thought it would be useful to make a post that can be referred to when needed to give a guide on doing this sort of job. This assumes the job is to turn dark to white and although there are other products that can be used this is the way that I have done it. It is written really for a DIY approach. Find a place to work. You need good ventilation using BIN as the fumes give you a fat head. The acrylic is fine to work with. Mask up as necessary to your paint lines. Start by gently sanding the surface removing any nibs. This is really just levelling out the surface. Wipe down thoroughly with methylated spirits to clean off any finger marks, grease spots and marks generally. Work out a logical sequence of painting. You have to work fast with BIN. Use the roller to apply the BIN as evenly as possible. 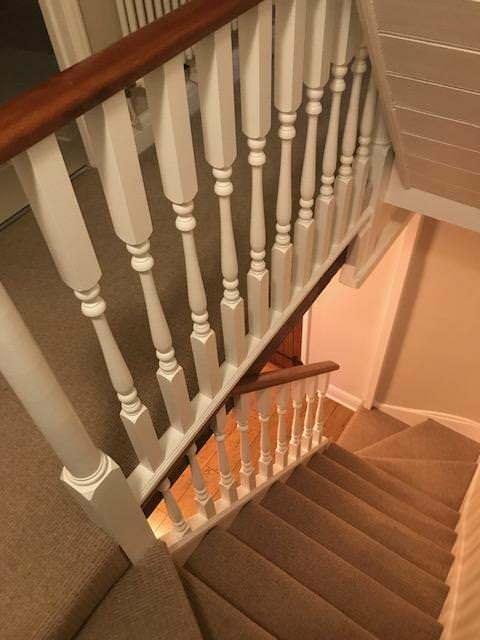 These rollers are very good with BIN and they cope well with turned bannisters. You might get a few bits of lint come off the rollers when new so have some kitchen roll handy to gently lift them off as you spot them. Keep a wet edge and work systematically. The first coat will look streaky and horrible but do not be perturbed it is the nature of the shellac based primer it is. Touch in any missed or thin bits with a brush after you finish each section. I usually just run the roller over to get a nicer finish after brushing it on. When you are done wrap the roller and brush in cling film to keep it 'alive'. Pour the residual paint back from the tray into the can and seal. Give it an hour to harden and then very very lightly go over it with the dulled off sandpaper to clear any nibs and make it feel smooth to touch. Wipe over with a cloth to remove dust. Then put the second coat of BIN on. This time it will look ten times better and it will leave a solid slightly satin finish. Chuck away the roller (unless you have another job to do) it will stay alive for a few days. Give it a couple of hours and repeat the gentle rub down and dust off. Using a new roller and tray use the Johnstones acryilc and do your first finish coat. This acrylic paint is a lot easier to use so focus on getting it on evenly and keep a wet edge again. It goes off quite quickly but it is far more workable than the BIN. Use the brush to touch in thin spots if necessary. I tend to leave it about two hours between the first and final finish coats, the longer the better. Let it stand for four hours minimum after the top coat goes on, overnight is good. Take care using handrails etc and let it go hard for a week. Good go. I would only change/break the links to screwfix because (a) it is not the cheapest; (b) links are likely to break and be meaningless after a few months. Yes, fair point. I will keep an eye on it. Those roller sleeves were really good for the BIN and the acrylic. Agree about screwfix, they sell the meths 500ml for £3.09, in Home Bargains 500ml of meths is 99p. Yes, I bought my chuck away brushes, trays and meths in Poundland. But they do not always have them. Chuck away brushes? CHUCK AWAY BRUSHES? What is the world coming to, next we will have people chucking away roller sleeves. I guess you don't try dry cutting in with them in the bathroom because by the time you finish going round the door frame they will have no bristles left. Hope you don't mind dewaltdisney . I have parsered your signature. Great Post but here's my twist. I tried BIN last year on a project. Admittedly it was a warm day, but I found BIN turned too quickly. I phoned up Zinsser to find out what thinner they would advise. They recommended something but then said Bulls Eye 123 would be better for my project. I got some, it's water based, and it is miraculous. I primed MCP (melamine coated plywood), radiators and wood with it. I doubt I will ever use anything else as a primer or undercoat since the prep is 'wipe with sandpaper to knock the snot off and wipe with meths to pick up the dust and oils'. It just saves so much time. 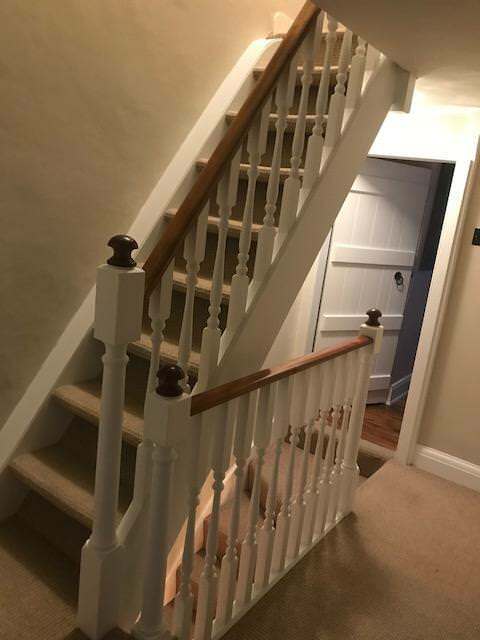 I guess BIN is not essential and 123 does the job but I was paranoid about colour bleed as I was not sure if my bannisters were stained with a varnish or a coloured varnish. 123 is still quite brutal on brushes I find... As I worked I literally could do 3 spindles and then run to wash the brush (Purdy Monarch Elite) and do another 3 spindles and repeat... God knows how many washes that brush had in its time doing the stairs.